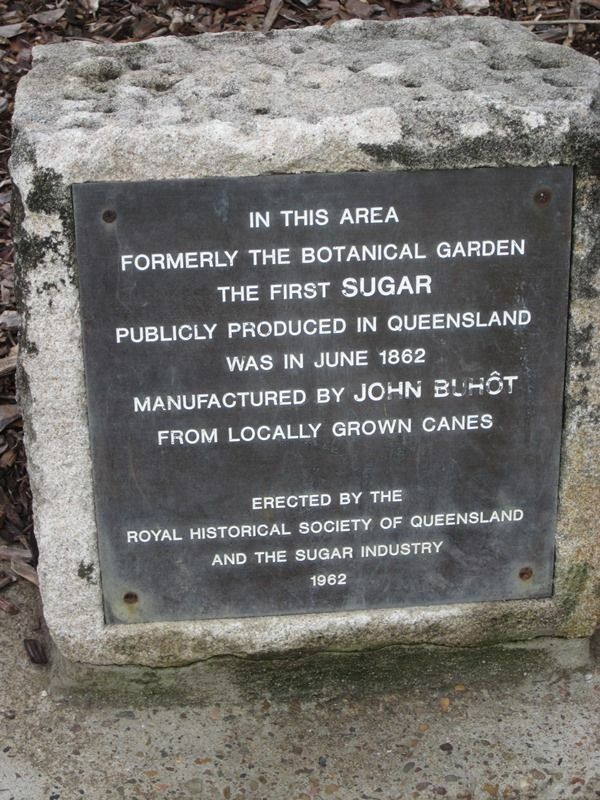 A memorial plaque, erected by the sugar industry in 1962, commemorates a John Buhot, a sugar boiler from Barbados who manufactured the first sugar in the Botanic Gardens in 1862. The canes for the sugar were supplied by Mr Walter Hill, Curator of the gardens. In 1874 a select committee chaired by (Sir) Samuel Griffith reported inter alia that Buhôt was the first to make sugar from cane grown in the colony and recommended that he be granted 500 acres (202 ha). Griffith's motion to that effect in the Assembly was defeated 24 to 5, after a debate in which several members criticized Buhôt and the limited nature of the inquiry. He died aged 50 in Brisbane on 11 September 1881. In 1884 Buhôt's widow applied for a gratuity of £500 in recognition of his services to the sugar industry, but she was not successful.